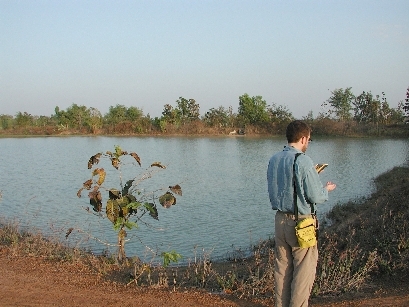 The role of Global Positioning Systems, or GPS, in the Nang Rong Project cannot be underestimated. From contributing major components to the development of the spatial database, to the facilitation of social network based research, GPS has been crucial in the collection of locational data for features, objects, and places on the landscape. Since a variety of geographic features are not reflected on maps or other geo-graphics, customized and targeted collection of spatial phenomena is facilitated through the use of GPS. For instance, if a researcher were interested in examining the distribution of rice mills in Nang Rong, fieldwork using GPS would enable the capture of the geographic coordinates of these structures, which might not have previously been mapped. Further, GPS allows for the creation of point, line, and polygon datasets, such as village centroids, recently constructed transportation routes, or the outlines of household agricultural parcels. The GPS data that has been collected for the Nang Rong Projects has been differentially corrected in order to reduce inherent positional error. Thailand maintains a network of base stations, the nearest one to Nang Rong located in Korat (Nakhon Ratchasima). For additional information about the history of GPS, how it works, and whatthe future holds, visit the National Air and Space Museum's site. corner point of a reservoir. 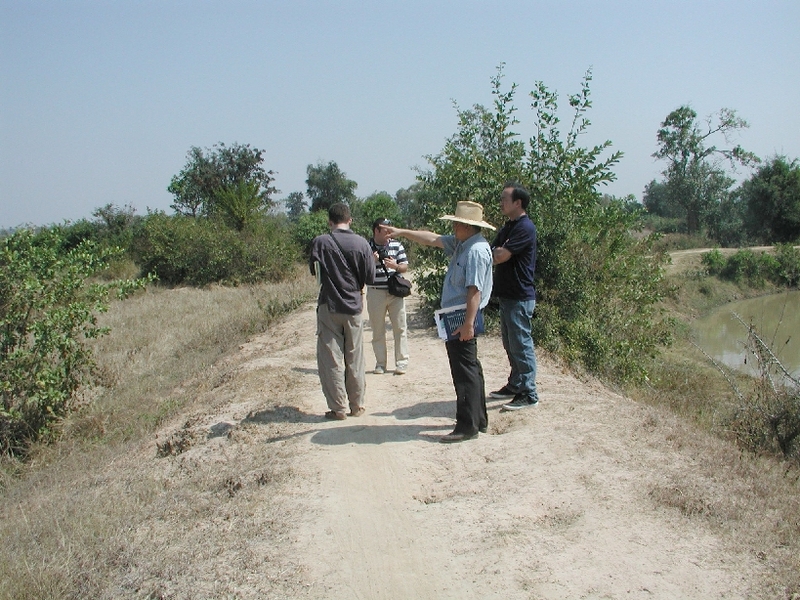 Another set of GPS points collected during the year 2000 fieldwork was the geodetic control. Gathered at major road intersections throughout the region, the GPS points were collected at these relatively static locatons in order to enable the registration and rectification of a number of the spatial datasets. For example, the transportation network, initially digitized from 1:50,000 scale topographic maps, was tightened up using the geodetic control points. Additionally, control collected at intersections that were visible on the satellite imagery aided the rectification of the Landsat data. The registration and mosaicking of aerial photographs also benefitted from the collection of an extensive network of geodetic control points. Land Use/Land Cover (LULC) data is collected in a rice paddy in Nang Rong. Following the inception of the spatial component, GPS was effectively utilized to capture the locations of the social centers and dwelling units for the survey villages. For each village that was part of the year 2000 data collection effort, a GPS point was collected at the approximate center of the village, be it a temple, a social center, or a headman's house. Further, field teams collected GPS points for all structures in the survey villages, which included such features as dwelling units, rice mills, temples, and any other buildings of note. While the collection of these points was a major effort, it helped to strengthen the spatial database, and laid the foundation for a host of subsequent population-environment analyses. Since features such as dwelling units are not depicted on traditional maps, such features would have been more difficult to locate prior to the inclusion of GPS in the Nang Rong Projects. Another major way that GPS is used by the Nang Rong Project is for the collection of Land Use/Land Cover (LULC) data. Following the classification of satellite imagery into LULC classes, the quality of the classification is quantified through assessments of accuracy. By comparing the classes of LULC maps to the classes as collected in the field by GPS data collection teams, insight into the overall quality of the classifications is enabled. For example, GPS points collected in a large field of cassava can be compared to a classified image from the same approximate date in order to validate the LULC map. Moreover, as the region continues to change, GPS field data is easily gathered, facilitating the tracking of landscape changes and the creation of current LULC classifications.